Weld Like a Girl™ is an empowerment project for girls and women using welding and creativity to boost self-esteem and whole-person wellness. We provide a safe environment to explore the mysterious world of welding and cutting hot metal, understanding that this world may be completely foreign and many will need some guidance navigating along the way. We provide a small group setting of usually no more than 12 people so that everyone can get the individual instruction and attention they need. 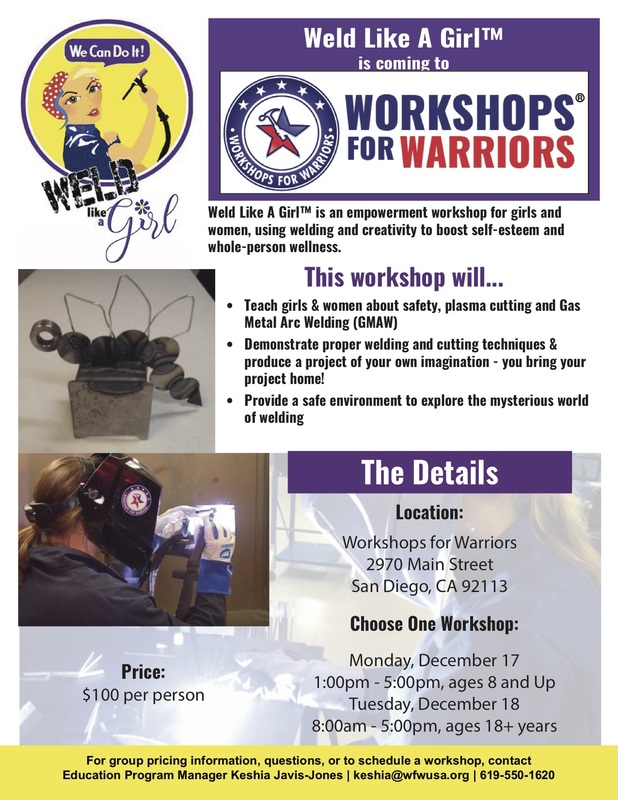 Weld Like a Girl provides all safety gear including safety glasses, welding jackets, gloves and welding helmets, and Workshops for Warriors will provide the welding machines, shielding gases, consumables and electrodes. Each participant of a Weld Like a Girl workshop receives a water bottle with included infuser so that healthy hydration can happen throughout the day.